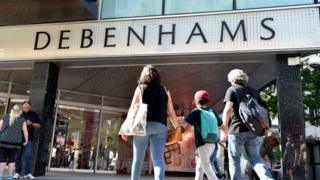 Debenhams has brought in advisers from KPMG to assess a number of options to improve the fortunes of the department store chain. It has issued three profit warnings this year, and has lost two-thirds of its share price value since January. Richard Lim, of Retail Economics, told the BBC: "The fact KPMG have been brought in does not surprise me. Debenhams will be wanting to look at all the options open to them. "The other part of the pincer movement Debenhams is facing, is that they are being squeezed on costs, with things like increasing rents and business rates, and rising wage and utilities bills. Mr Lim points out: "If you close stores you are in effect giving market share to your rivals. "So this is something retailers are very reluctant to do - even if profits are on a downwards spiral - unless there are no other options." Chief executive Sergio Bucher, who joined Debenhams in 2016, aims to put more emphasis on food and beauty and improve the firm's online platform.